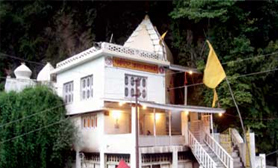 Sudh Mahadev is a highly revered temple in Jammu region. Believed to have been constructed more than a thousand years ago, this temple is situated in Chanhani town, which is located near Patnitop. It is one of the major attractions in Patnitop region. The temple houses a Trident (Trishul), natural black marble Lingam and a mace. There is also a holy spring called Pap Nashni Bowli near the temple that holds the reputation of cleansing the sins of anyone who bathe under it. This sacred shrine has a legend attached to it: according to Hindu mythology, a demon named Sudheet came to visit Goddess Parvati. But when the Goddess saw the demon, she screamed in fear provoking Lord Shiva to throw his trident at the demon and kill him. When he realized that what he did was a mistake, Lord Shiva resurrected the demon; since then this place is known as Sudh Mahadev. 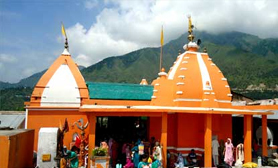 The main shrine of the temple has the presiding deity of Lord Shiva, his consort Parvati and his son Ganesha. Opposite to the main shrine are the shrines of Goraknath, Kal Bhairav and Bayankar Bhairav. There is also a small shrine of Ganesha, where his idols preside in different postures. During the Asad Purnima Festival, a large number of devotees throng Sudh Mahadev. This 3 day festival is held every year in the month of June and is one of the prime attractions in Patnitop. Cultural programs like dance and music are organized during this festival; a small fair is also organized for the entertainment of the people.